Tarja Turunen - one of the brightest stars in the world rock scene. Her strong mezzo-soprano, a unique manner of performance and charisma have made ​​it popular not only in his native Finland, but also far beyond its borders - from Europe to America, and from Brazil to Russia. Finnish rock and opera singer Tarja Turunen - ex-vocalist of the symphonic metal band Nightwish - again travels to Moscow to present their new album, What Lies Beneath. Tarja admitted that enthusiastic about the Russian fans: "The Russian public is very similar to the Brazilians, Spaniards or Italians - a real fire. You've got not a particularly hot climate, but you have a hot heart. Russian - very emotional people, they scream, make noise, and if they like you, they show it. " Tarja began his career with the group "Nightwish", in which a young female singer invited her classmate Tuomas Holopainen. The first demo of the new Finnish band was released in 1996, after which the group said the company "Spinefarm Records" and signed a contract with the musicians. Music, recorded a debut CD "Angels Fall First", was a true masterpiece, since the first time united in a traditional heavy metal with classical operatic vocals. For the second album of the collective «Oceanborn» was released outside of Finland, and acquired the status of the "Golden Disc", a person Tarja appeared on the covers of magazines in different countries. Despite the success of the group "Nightwish", Tarja did not gave up and solo career, while continuing to develop in the direction of the opera: she sang arias by Wagner and Verdi in the Savonlinna Opera Festival Choir, and in 1999, soloed in a ballet production of the Finnish National Opera House called "Evankeliumi . In 2000 Nightwish took part in the selection for the Eurovision Song Contest from Finland with their song «Sleepwalker». In the same year he published the third album the group "Nightwish" - "Wishmaster", which in a few weeks managed to reach the first line of the world's charts. In 2001, Tarja decided to get a higher musical education by enrolling in the "Music University of Karlsruhe" in Germany. During his studies, Tarja has recorded vocals for Nightwish «Century Child», as well as for the album «Infinity» Group Beto Vazquez Infinity. After several solo concerts in Germany, Tarja toured South America with a lead-concert «Noche Escandinava» (Scandinavian Night), together with Marjut Paavilainen, Ingvild Storhand, Izumi Kavakatzu. In 2003, Tarja said that married to Argentine businessman, owner of the record company «NEMS Enterprises», producer and manager of the Nightwish in South America, Marcel Kabuli (Marcelo Cabuli). After the break, Tarja Nightwish back in to record a new album «Once», which was well received by critics, and to participate in world tour in support of him in 2004 and 2005. October 21, 2005, after successfully completing a world tour, the participants reported Tarja Nightwish in an open letter that she is no longer the vocalist. Tuomas Holopainen Nightwish and other musicians accused her of changing priorities and the increased commercial interest. After being fired from Nightwish, Tarja went solo Christmas tour round.Tarja performed in temples and churches, performing classical compositions by such composers and writers as: Jean Sibelius, and Zacharias Topelius, Johannes Brahms, Germaine Greer, Amadeus Mozart and Bach. In 2006 he released a Christmas album, Tarja «Henkays ikuisuudesta», most of the tracks which are covers. The first full length solo album «My Winter Storm», in the style of opera, rock and pop music, was released in 2007, the company «Universal Music». In 2008, Tarja performance at the famous German Wave Gotik Treffen festival opens world tour in support of the album «My Winter Storm». In early 2010 came the last album Sting In The Tail of a cult band Scorpions, which is the lead single was the song The Good Die Young, for which Tarja Turunen recorded vocals. 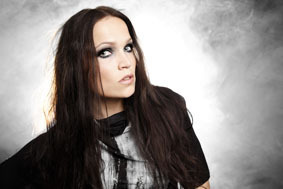 In avgustae 2010 via Universal Music released a new album titled "What Lies Beneath", the producer who made herself Tarja, and Tim Palmer (Pearl Jam, The Cure, Robert Plant), Colin Richardson (Slipknot, Machine Head, Bullet For My Valentine) and Slam Andrews ("Angels and Demons," "Pirates of the Caribbean," "Gladiator"). In addition to the National Symphony Orchestra and Chorus of Slovakia, the album was also attended by nine guest musicians, including renowned guitarist Joe Satriani (Joe Satriani). "What Lies Beneath" embodies a unique mix of drama and decibels, which displays Tarja to a new level of success. April 29 will perform in the Moscow club Arena Moscow in support of the second solo album.